If you've been following this blog for long, you may know of my love of roses. Roses on plates, roses on pillows, even roses on tole trays! I mean, is there any thing more beautiful than a bouquet of roses? If you are a romantic like me, you will agree! 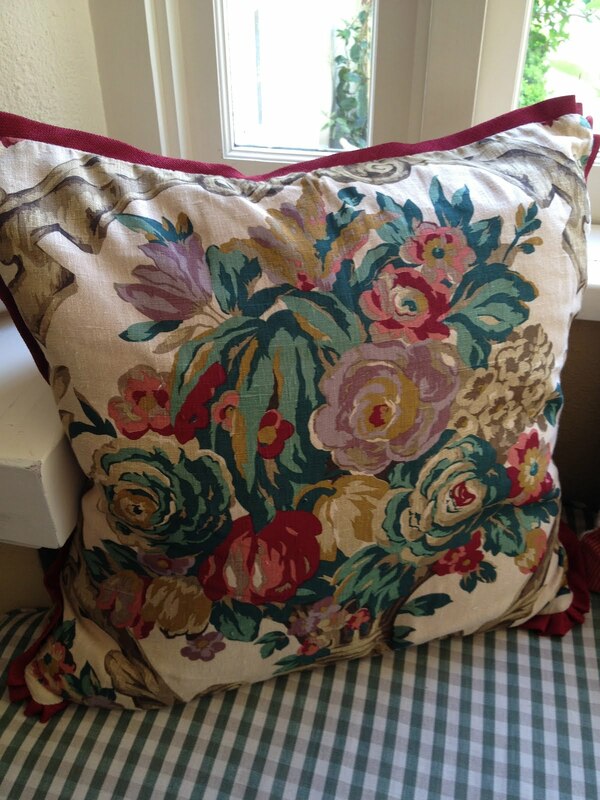 So, when these linen pillows came up for sale on OKL, I bought them without hesitation. I had no idea where I would put them. 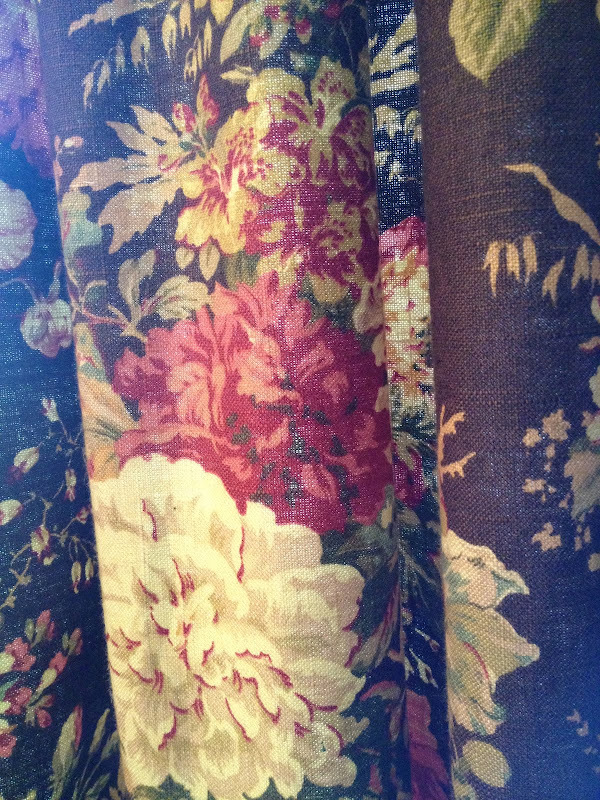 I just knew that a fabric this beautiful depicting cabbage roses would be too hard for me to pass up. But wait, didn't I go through this rose phase already? Well, guess what? I think this rose phase is coming back. And I think design is heading again in that direction. Have you noticed more florals lately in design magazines, fabrics and fashion? I have. We used to call it the English Country look. Remember? Romantic decor with floral fabrics and rugs. With fresh picked cabbage roses straight from the cottage garden. Yes, I think us romantics have always loved this look, and after several years of scratchy burlap and simple linen, a soft floral here and there is a welcome surprise. Again! 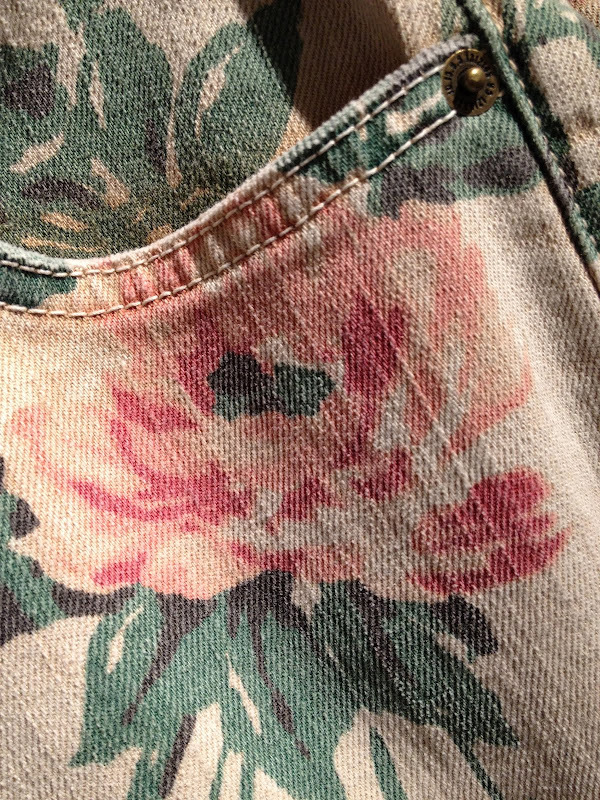 Yesterday while shopping with my daughter Ashley, we noticed lots of cabbage roses on clothing. There is definitely a romantic vibe going on in fashion too! A sure clue that cabbage roses are a design trend that is still here and not going anywhere! Which brings me to the word, "timeless." And that makes me a very happy girl! I think roses are always in style, and those pants..well. I saw on tv that large floral pants are big this year. All I can say is "not on my hips". They'd be really cute on you though. We just planted 4 new rose bushes last weekend and I can't wait for them to bloom. I was never much of a rose girl and now I love them and can't get enough of them! I love roses too. I love them in soft shades on pillows, and plates, and paintings etc. All of these pictures here are so lovely! Roses could NEVER EVER go out of fashion or trend! "We WON'T LET IT"!!! Those jeans are adorable, Hmmm, I think I would wear those! I definitely know that we can NEVER HAVE enough roses surrounding us...I just did a few posts on that very subject! 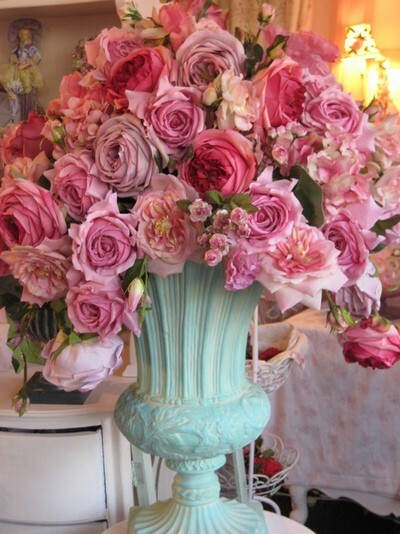 Oh my gosh I love, love roses...in anything, anywhere!!! Love them both as a flower and as design inspiration....to me its such a timeless classic. Never will go out of style. SO pretty! And to Rindy above, those roses are Iceberg roses and they are the best! I think either you are a floral gal or you are not. I have to have flowers in my home in boquets and artwork. I don't wear florals, but they are really big this season and seeing the jeans reminded me of a pair I had in the late 80s. that old saying what goes around come around. I am with you, my dear, soft and romantic...a good thing. I had that bark cloth faded pillow you have. I am afraid it is one of those things that was lost in the frenzy of the move to FL. Wish I had it now. Always have had a love affair for cabbage roses - on anything. But I swear I had those jeans about maybe 15 + years ago. Even if I had of kept them they would not fit. Everything seems to come full circle! 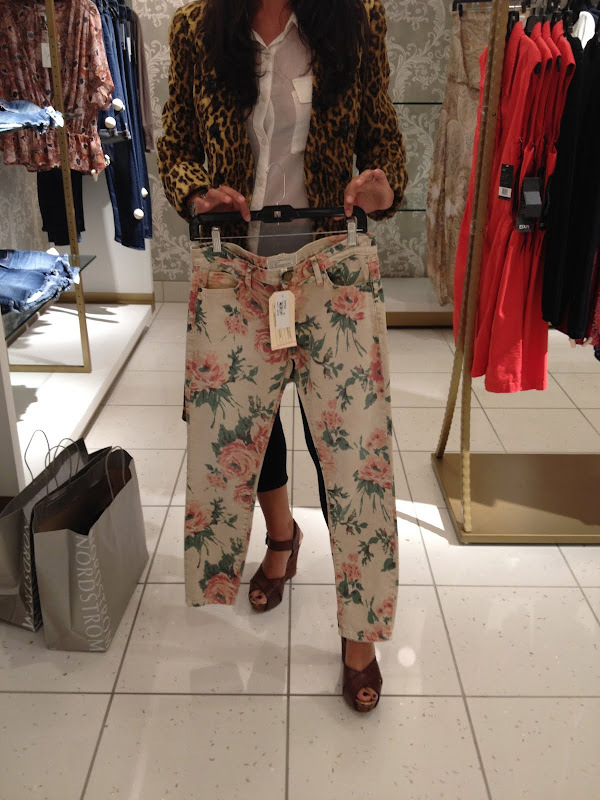 Love those floral pants but to look good in them, one must have a tiny figure like Ashley..who can look good in ANYTHING! Your roses looks magnificent, real and linen!! Beautiful post! Can you share the name of the charming china pattern? I'm a hopeless romantic...like you, I love roses! Cabbage or any variety will do here on the Prairie! Yes, those white roses are Iceberg roses. They are the best. Disease resistant and prolific bloomers. I have them in bush form and standard (topiary) form. I'm happy to see cabbage roses anytime on anything! I agree, they never go out of style. Thanks for sharing yours! Well I'm with you! I love roses too. They are my favorite. No other flower makes me as happy to be around them. Love all the roses! I think the cabbage rose jeans are so cute! Roses never go out of style. The china pattern is by Royal Doulton, Pomeroy pattern. Thank you! It's absolutely beautiful!